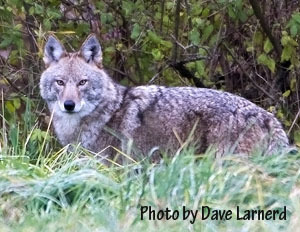 The Eastern Coyote lives throughout upstate New York and typically weighs between 30-50 pounds. Ranging from 48-60 inches long they are approximately twice the size of their close relative, the Western Coyote. Eastern Coyotes have a distinctive drooping bushy tail and range can be silvery gray or brownish red in color. Though often mistaken for a domestic dog hybrid, genetic research shows that eastern coyote's owe their large size to interbreeding with Canadian gray wolves. But, unlike the wolf or domestic dog, coyotes run with their tail pointing down. A coyote's diet depends on one thing... what is easiest to find or catch and kill. About 80% of their diet consists of small rodents and rabbits. During the summer months, coyotes will feed on berries, insects, and rodents. During the early fall they rely on abundant grasshoppers. Small mammals, like rabbits, fall prey during the late fall and winter. As winter becomes harder and small mammal populations decline, coyotes may turn toward their largest prey - whitetail deer, but usually the sickest and weakest of the herd. They will also feast on road kill and other carrion. It has also been proven that New York Coyotes can have an impact on fawn survival in localized areas during the early spring. How Many Coyotes Live in New York State? When you hear a family group of coyotes howling, it is easy to get the impression that the woods are overflowing with coyotes. In reality you are hearing maybe five or six... as few coyotes can make a tremendous amount of noise. The eastern coyote does not form a true 'pack' as wolves do. They are organized 'family units' made up of an adult pair (alpha male and female) and their pups from the current year. A family unit is extremely territorial and will defend their territory ( 6 to 15 square miles ) against other coyotes. It is the territorial behavior that limits their numbers in any one area. The total coyote population in New York State during the Summer is approximately 20,000-30,000. Young coyotes born yearly are driven from the territory between September and March. These young "rogue" coyotes will travel up to 100 miles in search of a vacant territory to claim as their own. Coyote are usually monogamous and are thought to mate for life. Females are only receptive for a few days in February and have a gestation period of about 63 days... usually having between 5 to 7 pups per litter depending on food supply and population density. The average life span of a wild coyote is four years. Although little is known about the mortality factors of young coyotes, several studies have shown that as many as 50-68% die in their first year.